PROJECTHINK is the ultimate exploration into the world of innovation and creativity in learning. Designed for educators, creatives and professionals interested in thinking outside of the box, PROJECTHINK will challenge perceptions and jumpstart creative sparks, from early education to lifetime learning. 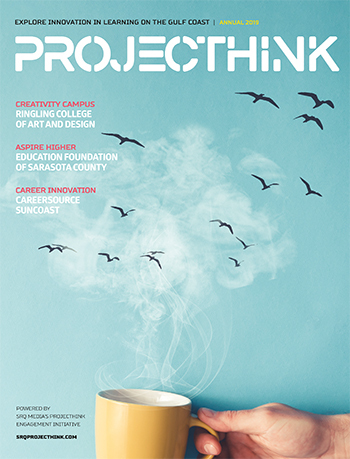 Hosted on the campus and in the studios of the Ringling College of Art and Design in Sarasota, Florida. Explore how the creative process engages critical thinking to helps us get "unstuck" from existing solution sets. How is learning adaptive? What are the new perspectives on engaging minds creatively at every age? How can organizations cultivate a culture that advances through challenges? From our youngest years as intrepid adventurers driven by the innate drive to sit up, crawl and walk to our more formative years in academic settings ranging from Montessori to traditional classroom settings, we have each experienced an incredible range of learning ecosystems. And now, emphasis on lifelong learning challenges us to continue to evolve in our careers, creative, philanthropic and community roles. The conference kicks off with a dynamic keynote presentation by Ismet Mamnoon, founder of Beyonder, TEDx speaker and featured in Time magazine's special edition on The Science of Creativity on the work she does globally to weave creativity into parenting and education. Featuring presentations by Dr. Larry Thompson, President of Ringling College of Art and Design; Jennifer Vigne, President of the Education Foundation of Sarasota County; and, Chris Laney, Director of Education and Community Advancement, CareerSource Sarasota. The next morning, attendees dive into a half-day conference featuring immersive workshops built in partnership with Ismet Mamnoon and the faculty of the Ringling College of Art and Design. Ismet Mamnoon kicks off the morning followed by immersive workshops with Ringling College faculty. Attendees will select one of eight tracks exposing them to the creative process employed by artists to produce art from glass blowing and printmaking to motion graphics and virtual reality. Experience how learning within these creative spheres can unlock ways for you to harness creativity in your world. Workshop facilitators find key crossover a-ha moments built from the workshop and how they apply to how we can transform how we think about teaching, learning, creating and solving problems in our professional environment. Join us for Lunch on the Lawn with local food trucks to continue the conversation. Imagery of student portfolio work courtesy of Ringling College of Art and Design. Kick off the conference with dynamic speaker Ismet Momnoon Friday evening and then engage in immersive workshops for the half-day conference Saturday morning. Hosted at the Ringling College of Art in Sarasota. Explore how to adapt the creative processes of fine arts, design and motion design to your professional world. Learning how we learn is a fascinating adventure and we are thrilled to present this year's lineup of speakers who share their insight and spark our curiosity. Video of 2018 ProjecTHINK Speaker Cyndi Burnett on innovation in teaching. Become a sponsor of PROJECTHINK and engage with a collaborative group of forward-thinkers inspired by innovations in learning. Contact Senior Vice President of Strategic Partnerships Ashley Grant via email or by calling 941-365-7702 x204. Each year, we curate a collection of speakers who are working to deconstruct, reframe and push the boundaries of creativity. For the 2019 Conference, we are taking experiential learning to a whole new level by engaging participants in the active creative process of exploring areas of work well outside of their comfort zone. Learning how we learn is a fascinating experience, even moreso when we get to do it hands-on. This year's lineup of immersive workshops facilitated by the talented and dynamic faculty of the Ringling College of Art and Design engage each participant through the creative process that shapes fine art, virtual realty, design, printmaking, graphic design, game design, motion design and the art of the pitch. During the final wrap up, facilitators Jeff Bletiz and Kathleen Sobr connect these immersive experiences with real-world applications of the creative process in education, professional life and innovation.